Dave at the finish, enjoying a beer. Dalton Gang finishes the 2013 Yukon Quest in 12th place!!!!!!!! 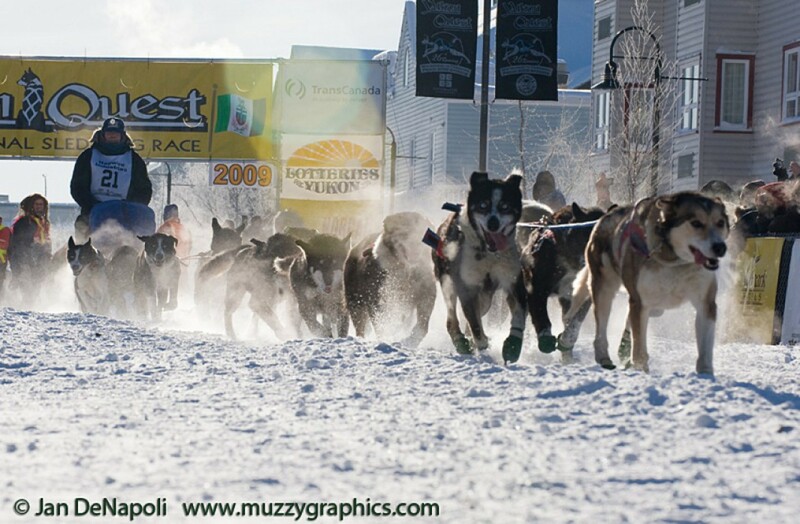 Allen Moore wins the 2013 Yukon Quest by 1 hr 16 minutes…. Compared to last year’s 26 second difference between 1st and 2nd place, Allen Moore secured his lead over Hugh Neff and crossed the finish line first. Still a super close race between those guys – way to go! Currently our friend Dave and the Gang are at mile 780, maintaining a good average speed, and are 17 miles from Central with 12 doggies. No word from Lee or Brian – hopefully they’ll check in soon. Looking forward to hearing how Dave and the Gang experience Eagle Summit. Out of Dawson, Through Eagle, Resting at Trout Creek! Sorry for the delays! OK – Dave left Yukon with 12 healthy dogs and let everyone know that his main focus from here on out was to take it easy and bring a big old team screaming into Fairbanks. The next leg of the race is all wilderness, as the Gang runs a couple hundred miles throughout Eagle and eventually landing in Circle City, USA. Currently Dave has been resting in at Trout Creek and is about 60 miles from Slaven’s. Lee and Brian won’t seem the team again until Circle. The Gang’s Campground in Dawson City. Looks like Dave has gotten a little rest! Checking out of Dawson, off to Eagle! No new pictures, but my tracker analysis shows Dave stopping about 7 hours ago and resting until approximately 9:40 this morning. In the night, the Gang was passed by several teams – as Dave runs through the day, hopefully the temperatures will stay cool, and the Gang carries on to Scroggie well rested and running smoothly. Dave and the Gang left Pelly at 1:50 yesterday afternoon, for the second time. The Gang ran a couple miles down the trail when Dave decided to turn around to drop another dog. With 100 miles to go before another dog drop, carrying a dog for that distance would be a tremendous burden on the rest of the gang and that dog. Not sure who it is, but a good call was made to return to Pelly and leave the dog with Lee and Brian. Leader Sandy, 2x Quest veteran, watched the Gang pull out of Pelly this afternoon with Lee and Brian by her side. Sandy’s the first dog to be ‘dropped’ – or left with Handlers Lee and Brian in Pelly for having a sore leg. From this point on, most dropped dogs will recieve massages and relax in the dog trucks – to be reunited with the team at the finish line. At this point, it’s possible that a second Gang member was dropped – but I’m not sure who. *****The tracker shows Dave backtracking to Pelly and dog drop numbers have been changed. Keep ya posted….